I haven't updated my count of book signings and such in awhile, so I thought I should. I'll be updating it a lot in September when we're on tour in Canada! Some of you know I recently skipped off to Florida for a little over a week, and now I'm telling you why. Every year since 2004 ( maybe missing one year) we have attended the International Christian Retail Show (ICRS.) It used to be called Christian Booksellers Association (CBA) but a lot more than books is brought to the convention - music, gifts, etc, so the powers in charge decided to the name to better reflect the convention's purpose. Publishers put together this show every year by putting up booths to show off their wares, and book store owners from around the world come and talk to the publishing house reps and network with each other and purchase some of their stock for their book store for the year. It used to be a giant convention, one could walk for 2 hours and not see the whole floor, but with more people purchasing on the web along with other factors, it is much smaller. Still, one can easily walk 2 miles in a day wandering around the floor. Publishers bring authors in to do book signings and give away books because that attrachs book buyers to the booths and lets them know the authors, which incentives the buyers to put those books in their stores. Make sense? And that is why my dad and I go to this show every year. And my sisters come, as well, but mostly for the candy that the publishers have in their booths. My sister and cousin were excited to get to meet Steve Green and get an autographed CD. I think the pictures turned out okay this year, but I like last year's pictures better. I signed copies of Precisely Terminated last year. They were pre publication copies, though, and didn't have their final cover yet. And I got to meet Roma Downey (sp?) the lady who plays Monica in Touched by an Angel. And no. Monica in the Cantral Chronicles was not named after Monica in Touched by an Angel. I didn't even think about them both being named that until I met Roma! Or Wednesday--That Works, Too. Noble Imposter is Here! Yesterday, I said Noble should arrive on Thursday, but it got here early! I have 100 copies of Noble Imposter to do with as I please, and I will be sending out pre-orders tomorrow morning! It looks really great. There's spot varnish on the train and train lights. Spot varnishing is the shiny parts of the cover, while the rest of the cover isn't so glossy. Precisely Terminated has some spot varnishing on it as well. The series logo, title, and my name are also embossed (raised), and feel really cool. That's when Noble Imposter is supposed to get here! My publisher, AMG, has informed me that NI (Or Noble, as they call it) is in their warehouse, and I should have my copies by Thursday! Huzzah! I'm going to Florida next week to introduce and sign copies of Noble Imposter at a book seller's convention! It should be fun. 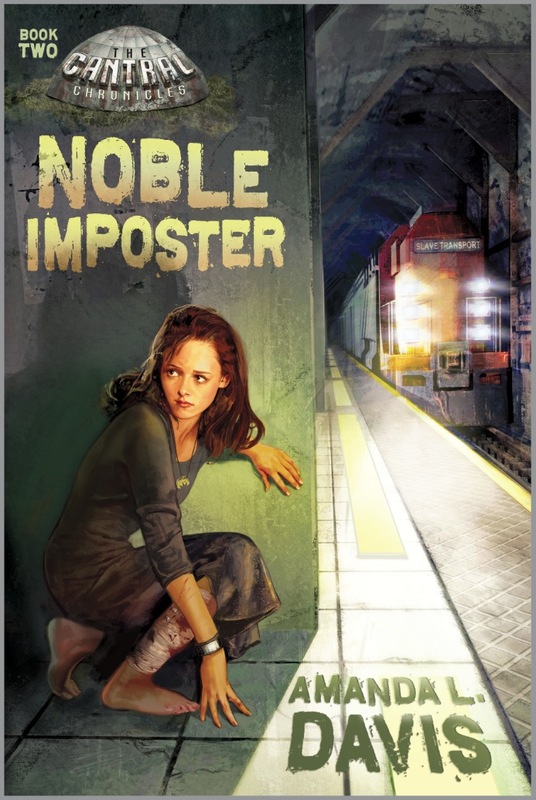 I really like Noble Imposter's cover. I've also heard rumblings that Precisely Terminated will eventually get a new cover. Not certain about that yet, but I'll be very excited if it does! And here is a bonus picture - Our neighbor's donkey had a baby 2 weeks ago. Isn't he adorable? He even let me pet his nose. I'm supposed to have my copies of Noble Imposter by next week! Hurrah! 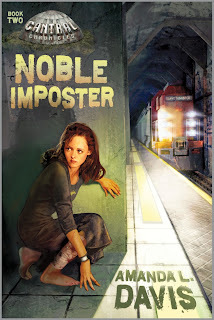 People are saying Noble Imposter is even better than Precisely Terminated, and I hope you find that to be true! I had never written a second book before I wrote NI, and it wasn't even planned when I got the contract for Precisely Terminated! I was given a contract for a trilogy when I had only the first chapter written for PT. I was a little nervous, but it's turning out okay so far! On the CCB3 front, I've now reached almost 28,000 words with a projected final word count of 105,000 (Give or take a few thousand). Things are moving along quickly, though Aric is in peril. You don't know who Aric is yet unless you're a pre-pub reader. :) He's introduced in Noble Imposter. This blog is scheduled to update every day at 8AM central time. I have more blogging material when it's about every day life and not just writing.